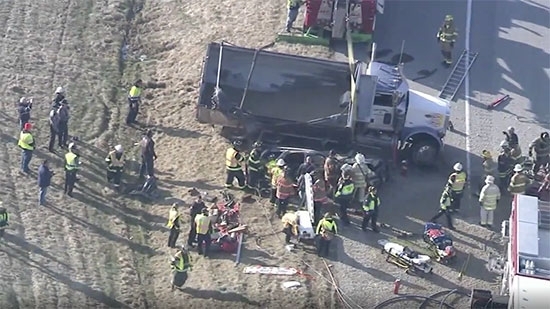 Two people are dead and three more are injured after a dump truck crushed an SUV on Route 202 in East Whiteland Township, Chester County on Wednesday morning, 12/12. The crash happened around 10 a.m. on the Route 202 southbound ramp to westbound Route 30 bypass. The accident caused the dump truck to tip over on its side and land on a Nissan Pathfinder, completely crushing the vehicle. A heavy machinery tow truck was brought in the lift the truck off the SUV. Two injured people are in critical condition. The other injured person has moderate injuries. The truck driver was not injured. The victims have not been identified. The cause of the crash is under investigation. UPDATE: Pennsylvania State Police say the fatal victims are 50-year-old Regena McCray-Palmer and 59-year-old Connie Motley-Wright, both from Newark, New Jersey. Eleven men and woman were arrested and large amounts of drugs were confiscated during a drug bust in Warminster, Bucks County on Tuesday afternoon, 12/11. It started around 4 p.m. at a home on the 600 block of Cheryl Drive. Warminster Police, Pennsylvania State Police, the Bucks County District Attorney's Office, FBI, and SWAT descended upon the quiet neighborhood to execute a search warrant on the suspected drug lab. The suspects were caught in the act of cutting and packaging the heroin. It is estimated this operation generates $8 million per week in drug sales. Besides the arrests, authorities confiscated 200 pounds of heroin and fentanyl, a loaded handgun, and at least $30,000 in cash. The scene was being treated as a hazmat situation due to the deadly nature of the drugs. A staging area was built in the driveway to process the evidence. They spent 10 hours at the scene removing evidence. The members of this drug ring tried their best to blend in on the street, even putting up Christmas decorations. Investigators received an anonymous tip about the operation. Police in New Jersey are investigating an incident of assault in the parking lot at the Deptford Mall last week apparently over a parking spot. It happened on Friday, 12/7, around 8:10 p.m. in the lot near Modell's Sporting Goods. The Deptford Township Police Department has released surveillance video of the incident. Three teenage girls left the mall and walked to their car. Two of the girls stayed outside the vehicle to smoke a cigarette and the other got inside. A white Pontiac pulled up to wait for the spot, but the girls waved them on saying they weren't leaving yet. A few minutes later, two women and two men walked past the car and physically attacked the two girls before fleeing by car. Anyone with any information is asked to call police at 856-845-6300, ext. 1337.